I've got a HP Officejet Pro L7580 printer and have two cartridges, not all four inks. I don't know where to get them from as I'm living in Canada?Thanks . Unfortunately, the HP Officejet Pro L7580 ink cartridges listed on this page will only work in the UK version of the printer. Ink cartridges are given specific numbers based on a particular region so you'll need to use cartridges with different numbers to the ones we supply if your printer was purchased outside of the UK. Please contact HP directly and they should be able to advise you of the correct cartridge numbers for your non-UK Officejet Pro L7580 printer and where these can be obtained. From faxing to scanning and copying, the HP Officejet Pro L 7580 can do it all. With an incredibly sleek design, the HP Officejet Pro L7580 can help you perform a myriad of different tasks, allowing you to use the HP Officejet Pro L7580 to create just about anything. Using the Officejet Pro L-7580 for all these different tasks can be a strain on your bank account, however, because HP Officejet Pro L 7580 cartridges like the black HP Officejet Pro L7580 ink are sometimes very expensive. You can compare leading HP Officejet Pro L 7580 ink prices to find out; HP Officejet Pro L7580 cartridges come at a high price. Fortunately we give you the option of purchasing cheap HP Officejet Pro L7580 ink cartridges from our secure server and we make sure you get the best value for money with your HP Officejet Pro L-7580 ink. For all your HP Officejet Pro L7580 ink needs, shop at CartridgeSAVE and buy top quality HP Officejet Pro L7580 cartridges! We know for sure that you’ll be satisfied with our HP Officejet Pro L7580 ink ordering process because purchasing HP Officejet Pro L-7580 ink from us is specially designed to be easy and efficient. We also offer an array of special services which come with the Officejet Pro L 7580 cartridge, allowing you to experience as little trouble as possible. Every HP Officejet Pro L7580 ink cartridge comes with free delivery for example, so that you get your HP Officejet Pro L7580 quickly and conveniently. The HP Officejet Pro L-7580 cartridge also comes with a straight forward money back guarantee so that you know for sure that you’ll get a quality Officejet Pro L7580 ink cartridge no matter what. This all-in-one device fits into most professional settings with its robust build and networking capabilities. Users can save time with the HP Officejet Pro L7580 because of its fast print speeds and automatic duplexer. However, it tends to be temperamental, its inks are expensive, the poorly-made printheads cause problems, and customer support is very hard to get. At 32.8 lbs, the HP Officejet Pro L7580 is one of the heaviest multifunction printers around; at 14 inches tall, 15.8 inches deep, and 20.9 inches wide, it is also among the bulkiest. Its size is just right for a small office, and its integrated flatbed scanner and copier are handy. The HP Officejet Pro L7580 has a 64MB RAM and memory card slots. The built-in memory card readers let users print directly from their memory cards. The HP Officejet Pro L7580 can print up to 35 ppm in black-and-white and 34 ppm in colour, thereby saving time. The fax machine is also praised because of the colour faxing and auto-redial features. The HP Officejet Pro L7580 is network-ready, with an Ethernet 10 Base-T/100 Base-TX connection. 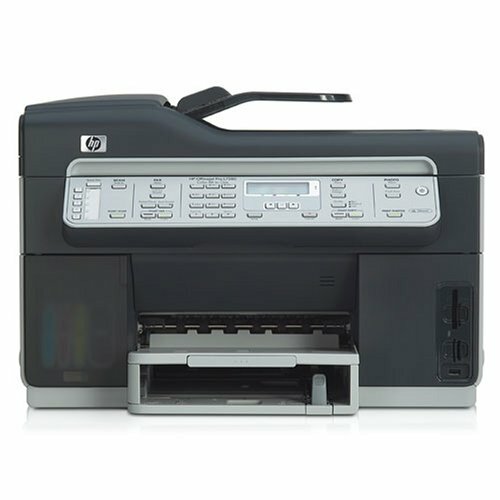 The hardware and consumables makes the HP Officejet Pro L7580 inferior in terms of durability and reliability. Printheads tend to wear out easily and are expensive to replace, much like the ink cartridges.